The library officially opened to the public on December 1, 1966. Originally designed by Irving Grossman Architects, a two-storey expansion later opened in 1983. The newly added space provided larger meeting areas and more room to house the library’s collections. On December 6, 2010, Cedarbrae Library reopened after renovations by Makrimichalos Cugini architects. Presently, the library features the Scarborough Historical Collection, adult literacy materials, and various audiobooks and CDs. 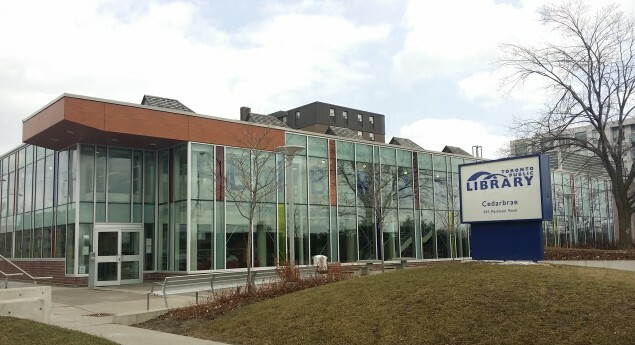 Cedarbrae Library is the third busiest library building in the Toronto Public Library system. Regular library programs include: computer classes, knitting groups, youth advisory groups, writing classes, immigration services, tax clinics, bingo, and reading groups. A great regional library. It recently underwent a major renovation which has resulted in a bright airy space. We have heard some interesting talks here including one by the author of Along The Bluffs. When did Cedarbrae Public Library re-open after its renovations?